Some people think that taking care of your lawn in the Spring & Summer is enough to have a great lawn. It helps but there are other things to consider as well. As the seasons change it brings other things into play that you have to tend to in order to help your lawn bounce back to a pretty state. Such as the winter snow and how to protect your lawn from snow mold. Snow mold is a fungus that attacks cool season grasses that can kill your grass as the winter comes to an end. It comes in two forms. One being Grey & the other being Pink. Kentucky Bluegrass grass and Fescue are least affected by this mold. But because it can attack all grasses it is something to be aware of. A lot of peoples grass is a mixture of different types. So if you live in a cool season, which does produce snow in the winter, this is a concern you should address. Heavy snow or piles of snow in your yard before the ground freezes can cause this problem. It traps moisture into your lawn. Just think about what will help this moisture to really set in. When you let your lawn enter the winter, you want to make sure it is not long, covered with debris such as leaves and other objects that will help the moisture set in giving the fungus it growing needs. One good way to battle it is to make sure you clean up around your lawn in the Fall so that you eliminate some of the things that could cause you to have a snow mold problem. If you catch the Fall early, it would help to remove any thatch build up by dethatching your lawn as well. One way is to think of preventative maintenance to help cut the disease off before it starts. This can be done just like if you were fertilizing your lawn. Scotts has a product that is is a Fungicide to help you fight the mold off. 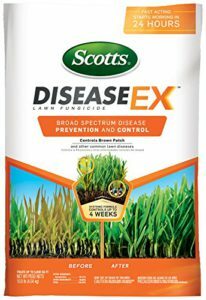 The name is Scotts Disease-Ex available for you to use before the snow starts falling. Primarily around Thanksgiving. 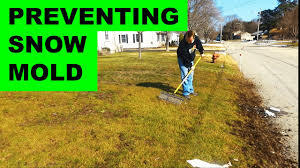 Because snow mold kills your grass you can always do some lawn repair if this happens to you. Scoots also have Lawn Repair Mixes for different grasses. For Fescue it will say Scotts Lawn Repair Fescue Mix and so forth for other grasses. This will allow you to repair any areas that got affected by snow mold. While you can’t control the snowfall all of these things you have complete control over. It is good to know what is going on with your lawn and how to help it to look its best when Spring arrives. Thank you for stopping in to visit us. 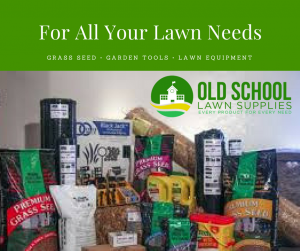 And remember, here at Old school Lawn Service we are here to help you the best we can in achieving success in maintaining your lawn. So don’t hesitate to give us a call.